The classification of the avocado tree involves much more than knowing its family, genus and species. While avocado trees are easily identified by their unique fruit, there are several races of these flowering trees, each having their own varieties. According to the University of Hawaii, they are evergreen trees with numerous branches that have oval-shaped leaves. The trees may be short with spreading branches or tall, growing 30 to 80 feet tall. Avocados originated in the subtropical regions of the Americas, but are now cultivated worldwide. The avocado tree belongs to the Lauraceae, or laurel, family, and it belongs to the Persea Mill., or bay genus. The Lauraceae family comes from the Laurales order, which belongs to the Magnoliidae subclass. This subclass is categorized under the Magnoliopsida class, which is the class of dicotyledons. This class emerges from the Magnoliophyta, or flowering plants division, of the Spermatophyta, or seed plants superdivision. The Spermatophyta superdivision comes from the Tracheobionta, or vascular plants, subkingdom, of the Plantae, or plants kingdom. 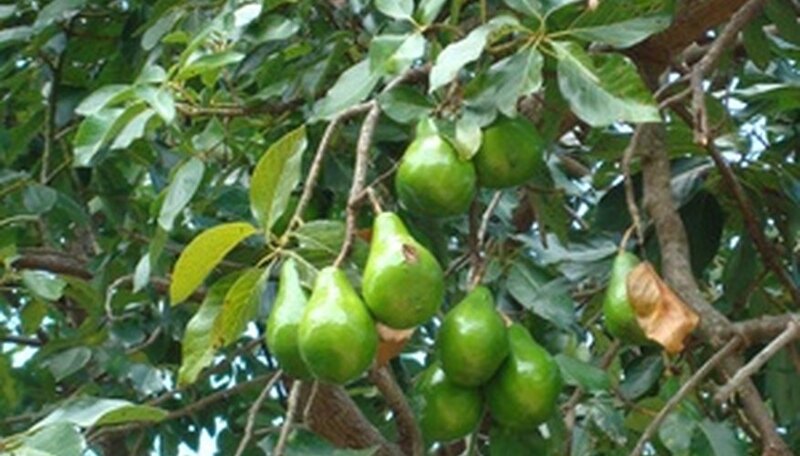 The avocado tree produces the avocado fruit, which are classified as berries. Unlike drupes, which have a stone or pit at their centers, avocados have seeds, according to the University of California. The parts of an avocado fruit are the exocarp, mesocarp and endocarp, which make up the pericarp and the seed. Avocados are native to Mexico and have been cultivated throughout Central and South America and the Caribbean for centuries. According to the University of California at Los Angeles, the name avocado comes from the Aztec name, ahuacatl, and the Incas called it "palta." Avocado is also known as "alligator pear," named by American colonists from its fruits' appearance and shape, and also "vegetable butter," "butter pear" and "midshipman's butter." There are three main categories, or horticultural races, of avocado trees. The Mexican avocado tree (Persea Americana Mill. Var. drymifolia Blake) produces small fruit with a thin and tender skin, and it has the highest oil. Some varieties include Haas, Duke, Ganter, Mexicola and Zutano. The West Indian, or Caribbean, avocado tree (Persea Americana Mill. Var. Americana), whose fruits have a leathery yet pliable skin, produces large avocados, which have the least amount of oil in the avocado types. Some varieties include Butler, Ruchle, Pollock and Trapp. The Guatemalan avocado tree (Persea nubigena var. guatemalensis L. Wms.) produces fruit with varying skin thicknesses. Its avocados are large in size and have somewhat high oil contents. Some varieties include Anaheim, Benik, Hazzard and Itzamma. Avocados can grow in tropical and southern United States climates, and the edible fruits of these trees are eaten fresh out of the pod or most famously prepared as guacamole, but also used in salads, sandwiches and sauces. Avocados have other uses such as a hair moisturizer, for skin and for scalp and hair-conditioning treatments. University of California Agriculture & Natural Resources: What Kind of Fruit is the Avocado?